Improve fire protection with the latest protocols for dry chemical extinguishing systems in new NFPA 17. NFPA 17: Standard for Dry Chemical Extinguishing Systems covers every aspect of dry chemical extinguishing systems -- from design to operation and recharging. The 2017 edition helps users understand the intent of requirements, to reduce errors and oversights. 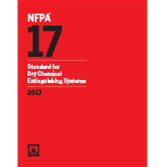 Interested in other editions of NFPA 17? Use the drop down menu above to select the edition year you need. 4.2 Hand Hose Line and Nozzle Assembly. 4.8 Electrical Wiring and Equipment. 5.2 Multiple Systems Protecting a Common Hazard. 5.3 Systems Protecting Two or More Hazards. 5.4 Dry Chemical Requirements and Distribution. 5.7 Operation and Control of Systems. 5.8 Dry Chemical and Expellant Gas Supply. 8.2 Location, Spacing, and Actuation. 9.3 Commercial Kitchen Hood, Duct, and Cooking Appliance Systems. 9.8 Vehicle Fueling Service Station Systems. 9.9 Systems for the Protection of Mobile Equipment. 9.10 Hand Hose Line Systems. Keep dry chemical extinguishers in top shape and ready to respond with the latest edition of NFPA 17. NFPA 17: Standard for Dry Chemical Extinguishing Systems covers every aspect of dry chemical extinguishing systems -- from design to operation and recharging. Criteria address total flooding, local application, hand hose line, and engineered and pre-engineered systems.